Submitted by innowen on Thu, 2006-08-17 09:00. I envy organizational web tools like BackpackIt and activeCollab. They keep track of all sorts of great projects from website design to book projects. Even 43 Things is a nifty site that helps me keep a list of all the interesting things I want to do throughout my life and links them up with others who have similar goals. I've got accounts on them all and have tried to use them for my crafting needs, but when it comes right down to it, modifying these great systems for use in art projects just doesn't work as well. Last week, that all changed for me. Enter CraftMemo, the latest organizational web tool to emerge. This website finally gives us artsy types an online tool to track our projects, materials and favorite vendors (online and off) in one handy place. I'll admit, I was skeptical at first. But being the productivity and online tool addict that I am, I went ahead and created my own account. And after looking around at all the things I could do with this site, and seeing the potential of what this site holds, I was hooked. Submitted by innowen on Thu, 2006-08-10 09:00. Altering books is a new art form that appeared a few years ago. In it, you breathe new life into an old or unused book by collaging, writing, painting and drawing or crafting niches into the book itself. In essence, you turn it into a piece of art. If artists can turn books into a work of art, it stands to reason that you too can alter your planner to match your personality more. Planners make great altered book projects because they track your progress over a year as well as your personality in one book. Instead of throwing out your planner pages every year, why not change them into wild works of art that become keepsakes and scrapbooks of your lives. In honor of my birthday which coincides with today's post, I thought it'd be fun to list out 10 different ways you can spice up or alter your planner or journal to make it match your personality more. Even though I may sometimes act only 10, these are some fun and fast things you can do to add a bit of creative fun into your planners and journals. Submitted by innowen on Thu, 2006-06-15 09:00. Many people think that you don't need to be organized to create art. For these people, art happens naturally by grabbing canvas and paint and "doing it". However, if you ask any artist, you'll find out that this isn't always the case. I know for a fact that if my studio isn't clean and tidy, all my tools and materials organized and out where I can reach them when I need them, I cannot work on any project. A disorganized workspace tends to stifle my creativity and leaves me feeling like I cannot do anything. 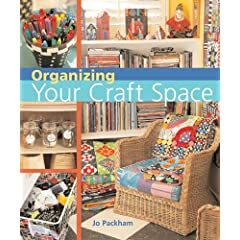 Recently while perusing amazon.com, I stumbled upon this book, Organizing Your Craft Space, by Jo Packham. What prompted me to purchase this book was the idea that it focused solely on how artists, from scrapbookers to quilters, can organize their space to maximize their time spent on creating their art. I also liked how it went into a multitude of art styles, rather than focusing on just one art. If you've always wanted to organize your art space or create a perfect place for starting a new craft, then this book is for you. Submitted by innowen on Thu, 2006-01-26 10:00. My mind churns out a consistent stream of new ideas to turn into artistic works. Typically I have anywhere between 3-4 creative projects in various states of completion at one time. I fall under the "rotational" school of creativity where I'll work on one project and keep on it until I feel I can't progress anymore. Then I switch to the next, and so on and so forth. Being a creative person of this type means that there is some preplanning and organizing involved. There has to be a flexible plan that allows me to rotate between each unfinished project. For each project that I have that does not take an hour or so to create from start to finish, I have a simple workflow that keep my items together with my layout ideas so I can pick up where I left off when I am in the mood. Submitted by innowen on Thu, 2005-11-03 10:00. Here in the Pacific Northwest, the remaining stragglers of colorful red, gold, and brown leaves are finally falling from the long branches of the tress from where they once hung onto. And yet, instead of rushing outside to collect the last remaining bits of color that provide contrast to a world filled with grey skies and green grounds, I sit inside my house, frantically finishing the opening words to my NaNoWriMo novel. If I had thought about it, Iâ€™d have spent my last remaining days before November outside, collecting leaves and other found objects to use in my collages and art projects. Alas, itâ€™s now too wet and I am bound to my chair to write and write and write until I complete my novel. I wanted to give you all a creative way to collect your own found ephemera (simply defined as objects that we collect that we can use to remake into something else) and store it in homemade planner envelopes so that it can be used in your artistic endeavors later on when the weather gets too bad for playing outside.